With this water pump, it will give you a relaxing place in your garden. When you are tired after a long day at work, you can have fun with your kids, family, and friends. 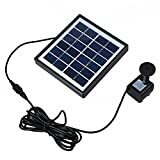 Add fun and joy to your yard or garden with this amazing solar powered fountain pump kit, which is good for small or medium fountains, birdbaths and ponds. This device is energy saving which can clean the air, decoreate the envrionment. It is a really great choice for people who advocate a healthy lifestyle. is it? Lifetime: 20000 hours. Just think about it, if it works 10 hours per day, you can keep it for more than 5 years. What a real buy! 1. The water pump will be blocked when it works in the muddy water. 2. Keep adequate water, make sure the water pump is beneath the surface spectially when in the sunny day. 3. Keep the panel clean and no damage. 3. If any problem, refund or replacement is available.